A visceral ride through a bio-punk future where life is cheap and death is the only way out. Welcome to 2085, the year of the rabbit. Fluorescent Black takes the reader into the hard-hitting dark future of South East Asia where gene-tech has divided humankind into two races: the rich, healthy Superiors and the sick, crazy Inferiors. These two races live in neighboring cities separated by a heavily fortified border. A superior named Nina is the test model for cutting edge genetic designs. She is a paragon of physical and mental health: her brain and body represent billions of dollars worth of corporate research and development. During a bio-terrorist attack, Nina is kidnapped by a street gang and taken across the border into a ghetto full of man-made splice animals, psychopathic hookers, drug addled freaks, deadly insects, poisonous ecosystems, and abandoned tenements. When the corporations tighten their dragnet, the gang quickly discovers that this is no ordinary captive… but she may be the key to solving all of their problems. Ladies and Germs, it is my pleasure to present onto you, Fluorescent Black. Now why do I say that? Because visually this books is beyond stunning. How so DD? Well glad you asked, I am a huge fan of Nathan Fox’s artwork, so it may come as no shock that I love this anyways. But let me dive a little deeper into it, because that alone only warrants a rating of 4. To get a 5 here this book had to not only be GORE-Geous from start to finish but it also had to fit every single thing that the story was trying to tell to a T, and guess what, it did. Nathan’s style fit this story so well, with its gritty futuristic, bio-punk nature that I doubt few others could have pulled it off. He was meant to draw this. Now of course we also have to take into account colors and letters here. 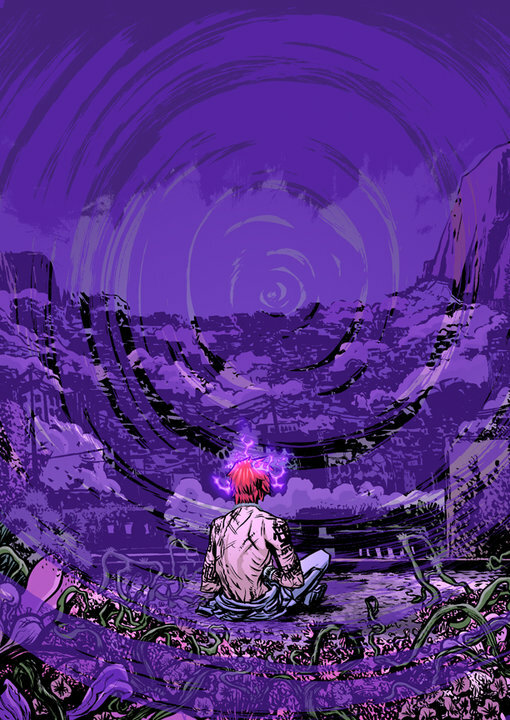 So lets start with colors, Jeromy Cox you killed it. You knew what to do and just destroyed it. If you want an example look below. So now a quick jump over to Sean Konot’s letters, which again worked to perfection. The bubbles fit into the style perfectly as well as the font choices. This is 192 pages of sheer visual bliss. Oh Mr. Wilson how can you live up to the artwork? Easily if you ask me, because you did it. This story is compelling, intriguing, action packed, entertaining and last but not least one of the best I have ever read. Now why a not a 5 on this one. Well I don’t want to get to far off track here, but when reading this in the pages of Heavy Metal, there were certain words that you had to decipher, since this is not set in America. So for just a slim bit of confusion I docked ya a little. However when I got the trade in my hands it had a dictionary so… YOU ARE SAVED! The story here is fresh and it just delivered everything I could want in a book. There was never a time where I was not interested. The dialogue was on point, with the minor confusion I mentioned, and it just delivered. This is what I want to read. So please bring me some more! I’ve been holding off on this little story I am about to tell for a reason, so stick with me here. When I decided I wanted to start checking out Heavy Metal it was only because of part 2 of this series being in it. The Nathan Fox cover just caught my eye and I knew I had to have it. Of course this lead me to search for the issue that had part 1, and then I had to wait for part 3 to come out. So I will make it very clear, this is a story that makes HM what it always should be. The other thing I have to say is that this Hardcover is HUGE, this book will stand out amongst the rest on your shelf it’s so big, and the design is great. So with this now being collected you now also get, art galleries, a map of the Singapore area where it takes place, a time line of how we got from today to the events in this book and the glossary. It has everything you need and more. Plain and simple I recommend this book. The artwork, the story and everything in between just blew me away and I don’t see how it couldn’t do the same for you. With a smile on my face I say go buy this book! 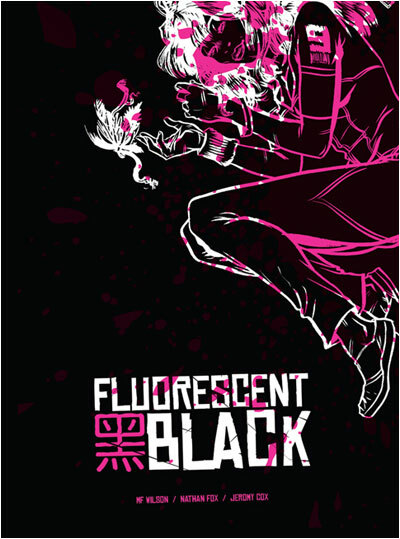 If you would like to buy or know more about Fluorescent Black you can find it at HeavyMetal.com.